Discussion in 'Youth & HS Soccer' started by VolklP19, Nov 8, 2018. Did you play? Do you still play? Yes on both accounts for me. Patches! 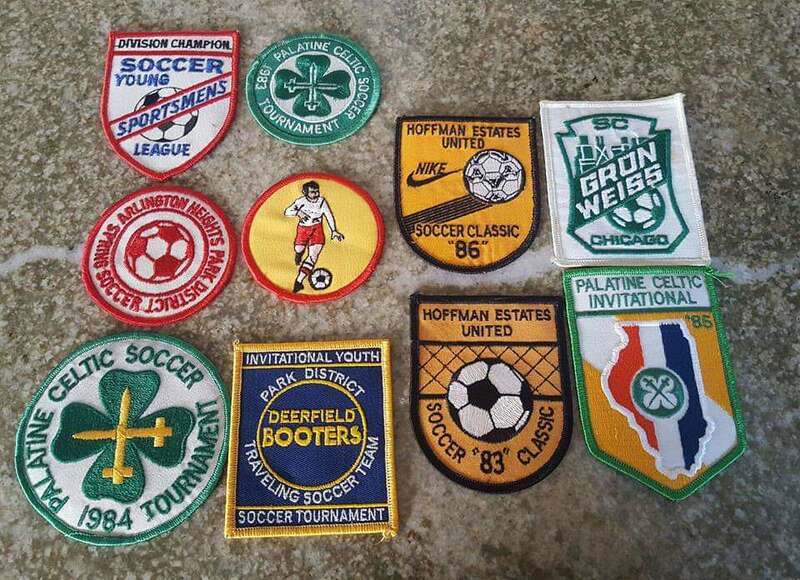 I had patches for a variety of sports. They don't give those out like they did in the 70s and 80s. All my son gets now are cheap, generic medals. I say bring back the patches! Still play (though not in about two months), and every bit as badly as I did in the late '70s and '80s. My son has played in one tournament I can think of that gave players patches, one of the Schaumburg, IL, tournaments, and he put it straight on the equipment bag. Medals seem to be quickly forgotten (unless they're for a title or a finals appearance). Never played as a kid--there weren't a lot of opportunities in rural Nebraska in the 70's. I wasn't very outgoing or athletic so when I went off to college it never occurred to me to try intermural. I became a fan in my early 30's (as a kid I'd wanted to play but as noted, there were no options) and a few years later took a chance on playing. Still playing a bit of indoor in my early 50's. I'm pretty bad and my ankles are shot but I still love it. I am still playing these days and I found it important to bring my kids to the games even though they are not paying attention. I do not have time to play for a team as there is too much commitment involved. I will go on meetup.com webpage and find a pickup game to play in and I usually play once a week. I started to play in the mid 80s in New Jersey when I was about 7/8 years old. Fun times, I wish I can go back into time and do it all over again. No youth soccer where I grew up but I played pickup with the refugee family in town. Played pick up/intramurals through end of grad school. I didn't start playing regularly until kids were in middle school. I now play at least once a week. Played growing up. Play now, when I can. Kids just started some "Little Kickers" program this year. It's all I can do to hobble around coaching the kiddo. I grew up playing soccer in the '70's. I never had a coach that played soccer until I got to high school. I got conned into assistant coach for my son's U5 team and have coached every year since, U14 now. I am amazed what these kids can do at such a young age, with the benefit of a generation that has played. It, also, sparked my renewed interest in playing. Hi everyone! I am a former DI soccer player at St. Bonaventure University and now pursuing a M.A. in Integrated Marketing Communications. As a requirement of our degree I have to conduct primary research on the topic of my choosing, so naturally I fell back to soccer. This survey is meant to be used as a teaching tool for conducting and analyzing the responses of current girl club soccer parent’s beliefs, attitudes, and perceptions of club soccer. I would greatly appreciate any current club soccer parents who could take a few minutes to fill out this survey to help me continue my education! Lastly, this survey is in no way meant only for the parents of a certain club team, so if you have a few seconds to forward this link to other girls club soccer parents I would be incredibly grateful!